The next video in ADZ World's ADZ Airdrop: "ADZ Giveaway 22 live event 19.08.2018" Like and/or comment the video in YouTube and earn up to 25 ADZ. After liking and commenting, don't forget to comment this post that you liked and/or commented as it is required to earn :) Go to this link and share that post to your social media and earn another 5 to 10 ADZ. You have to share the link of your share to this post to be qualified for the earnings. Go to this link https://adzbuzz.com/vote/2932437/adz-giveaway-22-19-08-2018-done-%C2%BB-adz-world and share that post to your social media and earn another 5 to 10 ADZ. You have to **share the link** of your share to this post to be qualified for the earnings. 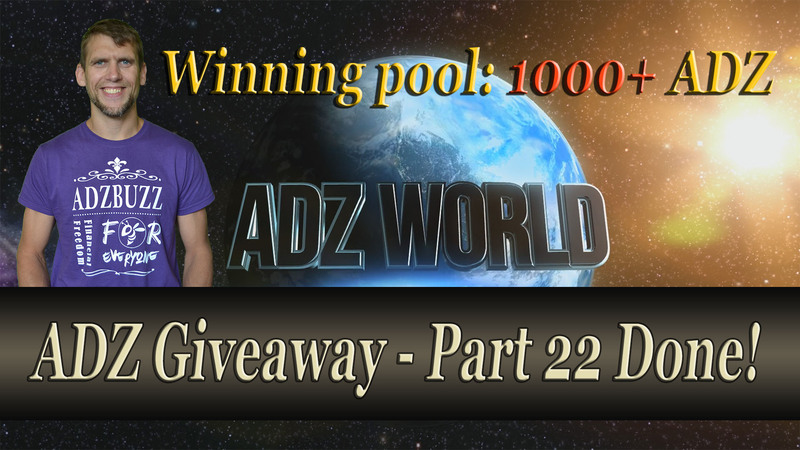 Don't forget to take part in ADZ World's ADZ Giveaway http://adz.2freedom.eu/index.php/2018/08/01/adz-giveaway-is-back/ too where you can win more than 500 ADZ a week.